"Menara City One is a freehold condominium located at 3, Jalan Munshi Abdullah, 50100 Kuala Lumpur . It is developed by UDA Holdings and was completed in 1997. Menara City One comes with 1 blocks of 30 storey building which comprises a total 502 units. The built-up size of the unit measures approximately 1,121 - 1,559 sf in size which includes 3 to 6-bedroom and 2 to 5-bathroom. Menara City One provides facilities such as barbecue area, business centre, cafeteria, club house, covered parking, gymnasium, jogging track, mini market, nursery, playground, salon, swimming pool and wading pool. Menara City One is near to amenities such as shopping mall (Sogo, Pertama Complex, Campbell Complex, Mydin, and Capsquare Centre), public transportation (LRT stations and KTM Komuter Station), colleges (University KL and The Malaysian Institute of Certified Public Accountants) and schools (SM (P) Convent Bukit Nanas, SRK (P) Convent Bukit Nanas and St John’s Institution). Menara City One is surrounded by a large network of roads and highways that make it convenient for commuting and travelling. 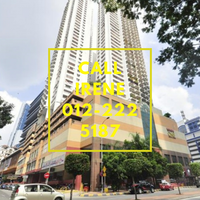 It is easily accessible via Jalan Dang Wangi, Jalan Ampang, Jalan Kuching, Jalan Tunku Abdul Rahman, Jalan Raja Laut, the Ampang-KL Elevated highway and the Middle Ring Road 2. Get me good deal if there is any units available in Menara City One.